Spectre, the 24th James Bond adventure, has broken all-time box office records in nearly every market in which it has been released so far. Its UK launch set a new record for movies released on a Monday - as opposed to a Friday - taking more than £41m in its first week. It beat previous Monday release record holder, 2004's Harry Potter and the Prisoner of Azkaban, which took £23.8m. Records were also set in the Norway, the Netherlands, Finland and Denmark. Spectre took $80.4m (£52.1m) in all six released territories. "We're so grateful to all our James Bond fans," producers Michael G Wilson and Barbara Broccoli said. Skyfall, the previous Bond movie, was the highest-grossing 007 film in the franchise's history, taking £700m ($1.1 bn) worldwide. Craig's fourth outing as 007 has received widespread critical acclaim, with one saluting it as "pure action mayhem". The Guardian's Peter Bradshaw described the film in his five-star review as "terrifically exciting, spectacular [and] uproariously entertaining". The Times said Sam Mendes' film was "achingly cool", while The Independent said it was "every bit the equal of its predecessor", 2012 release Skyfall. 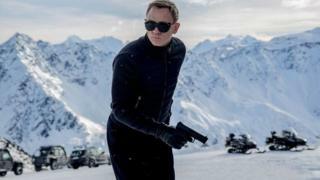 Spectre also broke opening-day UK box office records after taking £6.3 million by Tuesday. It opened in 647 cinemas on 2500 screens in the UK, making it the widest release of all time in the UK and Ireland. "What an incredible thrill it is for us at MGM to see how James Bond continues to deliver such excitement to his fans," said Gary Barber, MGM Chairman and CEO. Peter Taylor, managing director of Sony Pictures UK, added: "We are delighted that audiences in the UK and Ireland continue to embrace these stories about one of our biggest and best cultural icons." The movie opens in the US on 6 November where it is expected to top the box office, after a Halloween weekend of flops. Sandra Bullock's Our Brand is Crisis, and Bradley Cooper's Burnt brought in an underwhelming $3.3m (£2.1m) and $5.1m (£3.3m) respectively. Jurassic World has been this year's biggest film so far, bringing in more than £1bn worldwide.